The dining room is sandwiched between the kitchen and family room. What do you think of the way they defined it with sheer linen drapes instead of walls? If you’re wondering what makes the house smart, you can read about its high-tech features here. Enter to win the Smart Home 2013 before May 31 at HGTV.com. You’ll find more photos and information about the house there, too. What Happened to Ahmed Hassan on Yard Crashers? I love turquoise and I love it all over the house, BUT I think I would get tired of so much of it after a while. I find the drapes between the rooms interesting. I like the convenience of being able to clearly define a room, but open it up to feel more open when wanted. I feel a migraine coming on…….Too many jarring patterns that fight against each other especially the carpet & drapes in the dining room. Not a very relaxing room to enjoy a meal. The colors are a little too intense as well. I would spend all of my time outside ……. Oh, dear. I’m going to have to vote ix-nay on all that urquoise-tay! Looks like I’ll be late when / if I jump aboard the bright color bandwagon. That kitchen with the aqua walls + ceiling was just too much — it looked like a really bad + really aqua Mammoth Cave! Sorry, HGTV — but your magazine is too Calypso World for me, too. I’m not even happy when it lands in my mailbox! Okay, I must play nice, now: I did like all the clerestory windows. The metal roof + that pool were pretty awesome. I’m glad Linda Woodruff still has an HGTV gig — they’re replacing all the ‘older’ hosts** with Kens + Barbies. **Does anyone besides me miss ‘Homes Across America’ with Joe Ruggiero?Bring back ‘Gardener’s Diary’! TY for reading my ‘manifesto’ + for sharing, Julia. I agree about the blue ceilings. I would feel like I was cooking underwater. Ha. I loved “Homes Across America.” Wish they’d bring it back! Hey — cooking under water’s funnier than my Mammoth Cave reference! Kudos! I seem to have misspelled Linda W’s last name. That sort of thing bugs me — getting something wrong, I mean. My sentiment exactly Kay. I also loved Homes Across America too…..and the Lynette Jennings show. Both very calm, visually beautiful shows with low key hosts. As for HGTV…very disappointing lately. Really tired of Love it or List it, House Hunters and basement apartment renovations. yes, Homes across America. He always had very lovely upscale homes. I use to tape that show. I like the turquoise but I wish it had been an accent color. I think they just need to change the blue wall color on the first floor. It’s too much with everything else. Tone that down and suddenly the turquoise accents like the kitchen island will really pop. Yes to Homes Across America! No to the decor of this house. Just no. I do love the architecture, though. But I don’t care for bath tubs inside the shower. Too cold feeling for me. I do like the idea of the drapes defining the dining area, and the exterior is gorgeous, so there’s that. Like the house, but way too much blue. The red in the bedroom was nice and cheerful and would have looked good in other rooms. I did not like the curtains defining the dinning room, it would seem claustrophobic to me. I like a lot of room around a table for people to get in and out. All in all, great house, but with a little less turquoise. Almost forgot, did not like the focal point painting in foyer, way too jarring and with everything else too busy. Nice house, but of all the beautiful Florida locations, why Jacksonville? Wanda, just a heads-up, it’s been said that the taxes on the winnings of the house & car are SO HIGH that the money they give you doesn’t even cover it. Also, to maintain the property & pay the proberty taxes most winners end up selling it. NOTHING in this world is free! And with this, there’s a huge catch. I always wondered whether the winners kept the houses. Thanks for the information. I like this house, even the overabundance of turquoise. But I’m a northern city girl so the location holds no interest.If I remember rightly there has been only one big city location, a condo in Chicago. Oops, never mind. I just learned that HGTV offers the Urban Oasis contest. That’s more my style. Where have the quality shows gone on Hgtv. And why so much of one show like Love it or List It, Property Brothers, House Hunters. Can’t take that sarcastic couple on Love it or List It. Rarely watch Hgtv anymore and it used to be a favorite. I love the outside exterior paint colors of the house but agree its a little too much turqouise inside. The biggest thing I didnt like was the arrangement of the pool. Its all pool and decking and very little green space for a back yard. I guess if you didnt want much grass to cut it would be ideal. Give me a little more yard! I’m loving the bathroom and kitchen, wouldn’t mind if I won it! Fantastic blog, keep up the great work! I’ve been ready to jump on the turquoise bandwagon but not THIS MUCH turquoise. I do like some of the features of this house but it’s just too busy for my taste. Oh my. Blue is my least fave color to decorate with. However, Tiffany Blue I can take in small doses. That is not a small dose. I would hire a painter fast. Other than that, it is beautiful. I like the house but agree the walls need less color so the turquoise/aqua/blue is an accent vs overpowering. The clock on the landing is great as well as the framed prints in the entry near the kitchen. I like the look and it does tone down the wall color. Like other HGTV houses there are parts that I love but they are a bit over the top for me. If I won it there are some furniture pieces I would keep. Well, I love turquoise. I love bright colors paired with crisp whites. And I love cottage architecture. But…I think I would have to tone down the turquoise overload. Then some of the statement pieces (i.e. that island) could really sing. I love blue but I agree that toning it down on the main floor would let some of it stand out and pop more – like that beautiful kitchen island. I don’t like the pool area – too much hard surface. SO MANY things about this home I will change when it’s mine. I’m in it to win it seeing as I already live in the area! Some things are absolutely wonderful and some things are just horrendous. Overall I like the floorplan and am excited to make this house my own. Side note: there are NO screens on any of the doors/windows. This is Florida. AKA the tropics. You cannot survive without screens. What were they thinking!?! I love the exterior and the architectural design of the house. But instead of all that deck, I’d want more yard and green space. Decks have to be maintained, too, and I’d want more plants for privacy and color and lushness. As for the interior, too bright and turquoise (though I like the color in smaller doses) even for Florida. I don’t particularly care for these furnishings, though I know the designer is limited by what the sponsors have to offer. I like the kitchen, though a turquoise island would have been enough blue. I would have liked some sort of window beside the master tub. The three TV’s in the living room would make me crazy. Just how do you watch three different things at the same time, or is everyone wearing ear buds to listen to their own program? Doesn’t sound like it would bring people together to me. And I wish they’d been consistent with the wood finish in the living room – use the same pickled finish that’s on the paneled wall on the ceiling as well (and at least take the pecky cypress wall all the way up). It looks too chopped up with the weathered pecky cypress partial wall, white walls, white painted wood ceiling and beams, the white trim, and the segments of deep turquoise wall. I would have liked more of the pecky cypress and less of the turquoise. Pecky cypress can be expensive, and this feels to me like they were being cheap by limiting it to part way up a wall. In general, it seems like they try to do too much and it comes out feeling like a mish mash. As an artist, I love color. This house is absolutely stunning. I have been entering daily since the giveaway opened. I dream of the day that HGTV shows up at my door. The location couldn’t be more perfect. I have never seen a tub inside the shower before. I don’t think I’m a fan. I mostly like the house and the decorating, but they did go overboard on the blue. I think they used the bold colors more for a dramatic staging effect. Obviously whoever moves in can repaint. It’s surprising that so many people are commenting only on the colors, and not the actual house. Like they can’t see anything beyond color. Also, remember this is in Florida. If you can’t handle color, Florida may not be the place for you! Everything is bright and cheery! Yeah, too much blue for my tastes. I love that shade, just with a bit more restraint. I want that house! !…and I deserve it! Beautiful in every respect. It’s lovely, but not for me. It kinda looks like both house and furnishings came out of the same box. I think its beautiful inside and out. Not a fan of the dining room separations but loving everything else. I think she did a fantastic job! I would like to see a little less color, as it would be more relaxing. I love the idea of the tub in the shower. I’ve seen examples that have a more fluid transition between the two. The back yard needs plants in my opinion. Ok, so when I win the house……..some of that blue will become a calming sand color. I agree with everyone else…….tooo much blue/turquoise , a wee bit of over kill but hey it’s a free house so I’m not going to complain! This house gave me the blues 🙁 A bit too much, and could have been used much better as an accent color. The floor plan seems well thought out, the curtain “wall” was interesting. Not sure it would be something I would use! I really love this house! The only thing that bugs me is the huge fish hanging in the living room. It’s all so chic until you see that fish! I’ve entered every single day! Maybe I’ll get lucky?! well gee thanks for posting this….You have now “upped” my competition. I’ve been trying to keep this quiet! Hi Julia well this house looks beautiful on the outside but the inside I think has a few too many things going on. The curtains no way I would suffocate. The size of the home looks perfect if you can get past all the stuff.. Till next time Regards Esther from Sydney. PS I like the kitchen. I like the house a lot, but have to agree with most here and go with the “less is more” sentiment. I like the idea of the curtains separating the dining area, but I would go with a solid neutral. I love the family room and all the windows and the ceiling and also love the pool area. 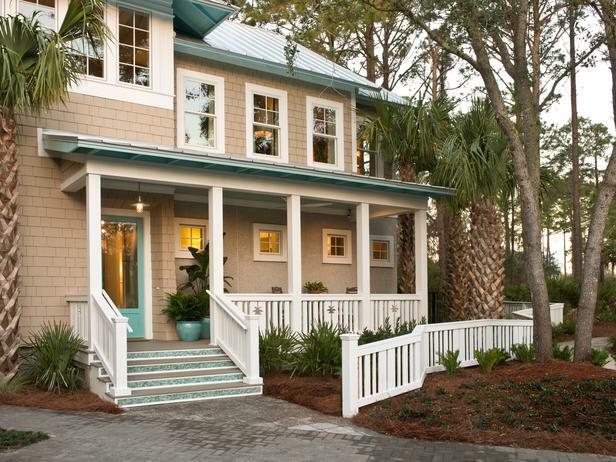 I love the use of turquoise on the exterior porch roof, front door and eaves. I even like the bluish metal roof; however, that interior gives me anxiety. That is too much blue…even for this turquoise-loving girl! I kinda like it, but I love blues yet I still think they went a bit overboard with it. I love the style and design of the home…however, from my perspective (and as pointed out in the article) there is too much blue. I would re-do it with more neutral tones particularly in the kitchen, hallway and exterior. Love some of the other uses of colour though, such as the bold red in the bedroom. That is so gorgeous! Would I be happy to win this home, (hopefully) constructivism criticism aside – YES! Overall I LOVE it …MUCH better than the other HGTV house. Yeah a lot of blue but hey it’s paint! Easily changed! I love everything about it. I grew up in Jacksonville and would love the chance to go home again. especially to a place like this. I think when you stand back the aqua color is more of an accent- the pictures are close up and fill the image. My front door here in Atlanta is painted this same color and it is done so to remind me of the tropics. Perfectly beautiful! I love show houses and these “model” -type homes. No mail piled up on the counter, laundry waiting in the hamper , or dishes in the sink.Just a fairy tale home for a fairy tale family. They are always full of ideas, like the curtained off dining room here. I love !! I loved everthing about the house.Iloved the colors that you used. I happen to love the turquoise…especially those little turquoise tiles on the risers between the steps going into the house and on the stairs within the house. I even love that big turquoise fish! Remember a designer needs to be abit innovative with her choices…otherwise, they could go without the designer and just slap beige paint everywhere and call it a day! So, since I’m one of the few who wouldn’t change a thing, maybe all turquoise-haters should refrain from entering this contest… Just, um, a friendly suggestion, ha ha! LOVE IT! LOVE IT BEYOND LOVE! Wow. This house isn’t really my style at all but I have to say I liked it a lot, apart from hating the turquoise risers and the painted board brain scrambler. But I loved the wood ceilings and the continuity of color felt peaceful to me, even though it was vivid. I liked all the downstairs spaces. Upstairs I didn’t like the orange bedroom or the bath. But I loved the laundry room…and I was pea green for it. I liked the layout of the outdoor space but wouldn’t be able to live with all that decking. Give me a garden! too tooo much color for me ……. I prefer the SC house to the FL house. The turquoise is nearly at the point of being overwhelming. I love the drape division of the dining room! I hope I win-I wouldn’t change a thing! Except for the vintage photos, I find them creepy unless you actually know who is depicted…. I am in love with the shower bath combo. I absolutely love it! I do not think that it was overdone at all. Strangely, it looks subtle and that may be because of the pastel color. I think it is pretty calming. I love the home, but would not live in Jacksonville! It’s disgusting there! Why JAX beaches?? Here in South Florida you have turquoise water for the ocean color and then you don’t have to do the whole house in turquoise! I want this house . I need a new start in life. Lost mother and my dog and my step dad.and three back and neck surgary . I need this. Can not wait to move in! I currently live just north of Jacksonville in Georgia. This would put me closer to all my children/grandchildren and life long friends. I grew up in Cocoa Beach, so this would be moving home for me. I love all the colors and the decorating. I can not think of anything I would change, except maybe add a mother in law suite above the garage. I love it. That green is my favorite color. I live the plates, pots and glasses. It’s so beautiful. It reminds me of my great grandmothers home in Flagler Beach FL. That was her favorite color too. The kitchen is my favorite room. My boys would love the pool. We have been wanting to move back to Jacksonville. I’m sure I don’t stand a chance to win something like this but it would be a dream come true. The colors are amazing and I am blown away by this home. I would be ” in love ” forever with this home if I won. I get lost in the design details when I examine the property. You feel like this home already has soul even though its brand new. On a comedic note, If I was sick with mono and couldn’t leave this home for a month I would be just fine! Love that home…. Since we’re getting older and looking to raising our grandchild there. I would not change a thing in this house I Love it just the way it is! I am it’s biggest fan inside and out. I think all of the people involved in it’s creation did an outstanding job with all their hard work. It would be sad if someone came in and changed anything. I Feel like this house was built just for me. This house would be a Godsend for us. My 82 year old Mother lives with my Husband and I. It is so hard for me to get my mother into the showers here also down and up steps to get in the car. When we built this home we were not planning to have her move in with us, this house would make this an easy task. Also I am at home most of the time taking care of her it would be a joy for her and I to have the sun deck and pool area to enjoy the outdoors without having to go any where, it is too hard on my Mother to take her out very often. She has seen the house also and is ready to move in right a way. Another thing we would enjoy are the fresh fruit trees in the yard that would be wonderful. We would be living on the Sunny Side of Life if we could only win this house. We are keeping our fingers crossed. This house is absolutely amazing! Every aspect is beautifully decorated. My favorites are the kitchen and bathroom. My marriage in May of 2012 created a blended family. My husband and I both have 12 year old daughters, who are exactly one week apart and get along famously! We all love to cook, and cherish our family dinners. None of us are all that fond of Wisconsin winters; this house would be a God-send! The Florida sun would surely heighten all of our serotonin levels and make us the happiest family ever! Some fun in the sun is definitely in order! I really need to get that house i been looking across town for that house i didnt found it .untill now plz . After a look at the interior design of this house I thought I should give the designers a little benefit of the doubt so I looked at the other in South Carolina. You were kind in your comment about the designers going a little “overboard” on the blue. Their jump off the ship began well before they got to this place. The obsession with blue began in the former interiors where it is an overriding focus of the house’s theme though a small shadow of what has been done here. I don’t think this is interior design. It is a amateurish attempt to make a space provide a photograph for a media outlet (HGTV) to promote their programming lineup. If one truly desires to view and understand interior design just google or bing or whatever you might use to search the Internet: Donald Deskey, Angelo Donghia, Mark Hampton, Ted Graber or William Haines to name a very few. Each of their individual styles can be recreated with the same affordable paints, fabrics, derivative mass produced furniture and reproduction lighting used to create the crayon & construction paper exercises shown in the photos. This house is amazing! We need this soooo much! my house has purple countertops and purple floors. it is just drop dead awful! The house was a bright peach and the house looked like something from a coral reef. I feel like a fish living in it. And my neighbors have a deck that they are always on and they can see every thing we do. its awful! this house would be perfect! hope we win! Way too much turquoise…especially the permanant fixtures such as tile etc. Guess I don’t much care for this designer as I wasn’t impressed with the other house decor either.